We’d love your help. Let us know what’s wrong with this preview of The Last Secret by Sophie Cleverly. A brand-new mystery for fans of Harry Potter and Murder Most Unladylike children’s books, The Last Secret is the sixth and final book in the Scarlet and Ivy series. When Scarlet and Ivy return to school after the holidays, they quickly realise that the school is in danger. 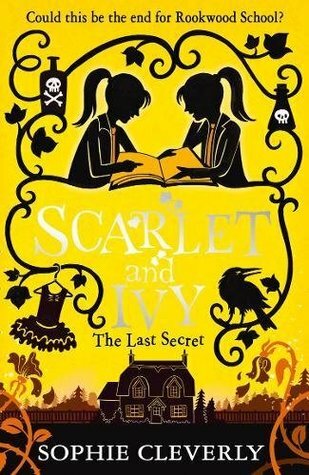 The twins will need to confront enemies from their past and present if they are to have any chance of A brand-new mystery for fans of Harry Potter and Murder Most Unladylike children’s books, The Last Secret is the sixth and final book in the Scarlet and Ivy series. When Scarlet and Ivy return to school after the holidays, they quickly realise that the school is in danger. The twins will need to confront enemies from their past and present if they are to have any chance of it surviving. Could the last secret at Rookwood be the one that brings it down? Or will Scarlet and Ivy be able to untangle the trails of clues and red herrings in time to save it? To ask other readers questions about The Last Secret, please sign up. what is scarlet and ivy's surname? does this book feature Ariadne? I have loved this series so much over the last few years that reading the last page of this book was inevitably quite bittersweet. It was wonderful of course, a fitting final book and one I found just as compulsively readable as the other five, but I'm also going to miss Scarlet and Ivy's adventures so much! I know I can (and will) reread them, but that first time journey is done. It's been a privilege to experience these books - for me the first book was one of those ones that seems to be spark I have loved this series so much over the last few years that reading the last page of this book was inevitably quite bittersweet. It was wonderful of course, a fitting final book and one I found just as compulsively readable as the other five, but I'm also going to miss Scarlet and Ivy's adventures so much! I know I can (and will) reread them, but that first time journey is done. It's been a privilege to experience these books - for me the first book was one of those ones that seems to be sparkling (in a metaphorical sense) and jumps out from the sea of others on the shelf. You somehow already know it's a book that is just right for you. After that I eagerly awaited the release of each book, a twenty-something year old rushing to the childrens section to grab my copy (though I'm quite honest about the fact that that area of books stores remains my go to. You are never to old for a well written, magical book) and reading it as soon as I had a spare few hours. This was a defect end to a brilliant series, and actually one of the stronger books - I think for me it harked back to the first book, with looking for clues around the school and I really enjoyed that. I also loved that we had some resolution for the twins family. And that the new whispers was the wider group. I especially laughed when poor Ebony was so confused by all the things she’d missed, it’s hard not to feel sorry for someone who is just hearing about all the past adventures while she’s b This was a defect end to a brilliant series, and actually one of the stronger books - I think for me it harked back to the first book, with looking for clues around the school and I really enjoyed that. This was such an amazing end to the series! I loved the writing, the characters, everything. It’s been an unforgettable journey and I hope to read it again. Unfortunately, this is the last book :( No more trouble. No more secrets. No more evil teachers. The last secret was suspenseful (just like the others) and was wrapped up beautifully. I loved it! It was a brilliant plotline for the series and a great ending too... I just wish it wasn't over yet! Love this Book series. I hope this Author . Write a spin-off series. A wonderful end to the story. It was good to have a resolution to the story of Scarlet and Ivy's home life as well. I'm a little sad to be leaving Rockwood School behind but can't wait to see what Sophie Cleverly does next. I found this a bit slow at the start, but then it gathered pace and wrapped the series up very well. I've enjoyed these books - and would have adored them as a kid - and look forward to seeing what Sophie Cleverly writes next. This book made me think about faith when in the book Scarlet and Ivy's fathers says "I am so sorry. I've let you both down." The author is teaching us about faith because in this book Scarlet and Ivy have faith when their father says that he can help them even tough he has pretty much ignored them for most of their life, they do believe in him and he ends up helping them save their school. My opinion about faith is that is is very important to have because if you don't trust anyone/have faith in t This book made me think about faith when in the book Scarlet and Ivy's fathers says "I am so sorry. I've let you both down." Aside from writing, she can often be found blogging about symphonic metal, watching fantastical TV and struggling to f Sophie Cleverly was born in Bath in 1989. She studied for a BA in Creative Writing and an MA in Writing For Young People. She is the author of the SCARLET AND IVY series, which is published in English by HarperCollins worldwide and is being translated into many different languages.